Hailed as the finest combat aviation novel to emerge from the Vietnam War, Flight of the Intruder spent 28 weeks on the New York Times hardcover best-seller list and became one of the top-20 best-selling first novels of all time. An instant classic, the book was translated into more than 20 languages and made into a major motion picture. Its hero, Jake Grafton, became a household name and the star of many more Coonts’ best-sellers. Without question, the strength of the book lies in its flying scenes when Jake Grafton straps himself into the cockpit of his A-6 Intruder. Great stuff! War and romance. Tommy Carmellini is sent to post guard duty at a farmhouse in Virginia's remote Blue Ridge Mountains, where top government operatives are debriefing a star defector: the ultimate KGB insider, a man with records on every operation and every dirty trick the shadowy intelligence agency has ever run, from Lenin to Putin. Fast Paced - Good Read! A spy plane gathering data on a new Russian weapon is blown out of the sky by a mysterious MiG. Is it an accident or the start of the next world war? 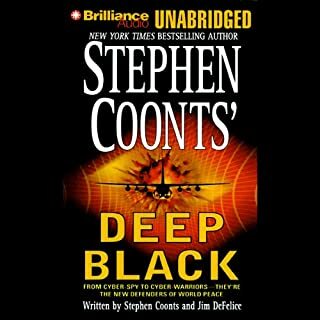 One U.S. agency has what it takes to find out - the National Security Agency and its covert operations team: DEEP BLACK. 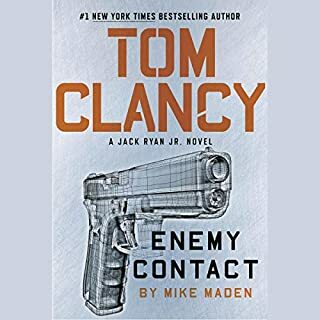 On a routine intelligence gathering mission in Tehran, Jack Ryan, Jr., has lunch with his oldest friend, Seth Gregory: an engineer overseeing a transcontinental railway project. As they part, Seth slips Jack a key, along with a perplexing message. When Rip Cantrell, a seismic survey worker in the Sahara, spots a glint of reflected light in the distance - he investigates and finds a piece of metal apparently entombed in the sandstone. Before long, Rip and his colleagues uncover a flying saucer that has been resting there for 140,000 years. It is fall. CIA analyst Jack Ryan, historian and former Marine, is vacationing in London with his wife and young daughter. Suddenly, right before his eyes, a terrorist group launches its deadly attack. Instinctively, he dives forward to break it up, and is shot. It is not until he wakes up in the hospital that he learns whose lives he has saved - the Duke and Duchess of Kent. For a moment Wilson froze and looked at the white-helmeted pilot who sat high on the nose of the colossal fighter. Across the small void, he saw the pilot's eyes peer over his mask. Dark, chilling eyes. Wilson kicked right rudder to slide closer and jam any chance for a bandit gunshot. When the bandit pulled all the way over, almost on its back but in control, he cursed in frustration at what he knew was coming next. I Cannot Believe I Passed Up Griffin For Years! Tracking a notorious Chinese smuggler's activities leads Dirk Pitt from Washington State to Louisiana, where his quarry is constructing a huge shipping port in the middle of nowhere. Why has he chosen this unlikely location? The trail then leads to the race to find the site of the mysterious sinking of the ship that Chiang Kai-shek filled with treasure when he fled China in 1949, including the legendary boxes containing the bones of Peking Man that had vanished at the beginning of World War I. Two armed men board a 727 that has been all but forgotten at an airfield in Angola. Hijacking the jet, they then slit the throat of the lone crew and fly to parts unknown. The consternation is immediate, as the CIA, FBI, and other agencies race to find out what happened, in the process elbowing one another in the sides a little too vigorously. Fed up, the president of the United States turns to an outside investigator to determine the truth. Interesting characters, good plot, slow paced. This is the book that dares to show us the military hardware, global upheavals, and raw combat a second Korean War would unleash. How F-16s would blast across the 38th Parallel. How ultra-modern submarines would vie for the seas. And how two armies would turn the snowfields of Asia red with blood. A thundering geopolitical thriller of vast scope, this is Red Phoenix - and a new standard for military/political suspense fiction. In the first weeks after World War II, a squeaky-clean new second lieutenant named James D. Cronley Jr. is spotted and recruited for a new enterprise that will eventually be transformed into something called the CIA. One war may have ended, but another one has already begun, against an enemy that is bigger, smarter, and more vicious: The Soviet Union. The Soviets have hit the ground running, and Cronley's job is to help frustrate them, harass them, and spy on them any way he can. When the Soviet Union collapses, thousands of nuclear warheads go unaccounted for, and it’ll take someone of Jake Grafton’s talents to make sure they don’t end up in the wrong hands. 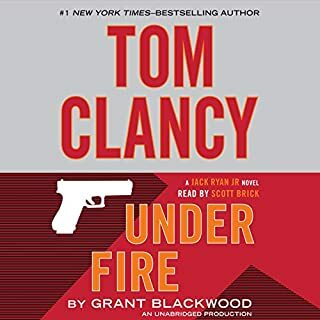 Promoted to deputy director of a new U.S. intelligence agency, the stakes of Jake Grafton’s commission are higher than ever before. With the USSR on the brink of dissolution, a vast nuclear arsenal is suddenly ripe for the taking by mercenaries, rogue nations, and insane Russian nationalists. Grafton must stop them, and he may have to do it alone: Not everyone supposedly on his side wants him to succeed. 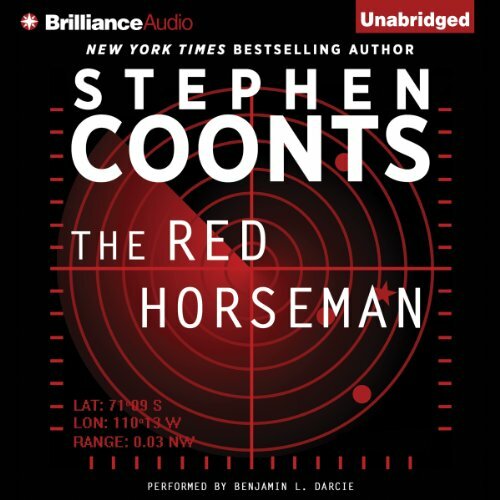 The Red Horseman is a startling vision of the apocalyptic danger that emerged at the end of the Cold War, a threat that still exists wherever nuclear weapons remain poorly secured. Jake and Toad save the world, again. This time in Russia during the 90s with a nuclear meltdown, a dog fight between an attack airplane and a fighter, killings in the streets and a pesky reporter. Action galore. Where's my next Coonts book? Great, but dated, military and espionage thriller! This novel is set in 1993 in Washington DC, Moscow, and Iraq. The issue that it deals with is Russia's nuclear arsenal after the USSR dissolved. It is well worth listening to despite being dated. All of Stephen Coonts' novels are excellent. Highly recommended. I've been a Jake Grafton fan for years and this book was was well written and I eagerly await the next book in this series. A complicated twisting and spellbinding take. This one must have kept Stephen Coonts awake for months to stitch all of these plots together! Fighter Ace, Navy Seal and Admiral???? What would have made The Red Horseman better? a military technical advisor, particularly where Navy Seals are concerned. 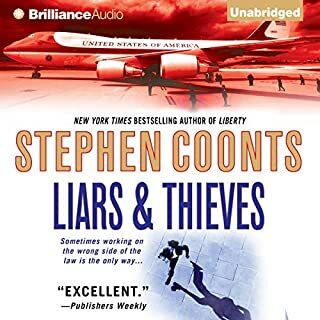 Would you ever listen to anything by Stephen Coonts again? Probably not. I enjoyed the other books, but this one and the previous book were too far fetched. What does Benjamin L. Darcie bring to the story that you wouldn’t experience if you just read the book? The Narrator is excellent. The different voices and inflection he uses are perfect. Sadness in wasting so much time listening to this book. Very disappointed in the Author. Not sure he is even trying anymore. 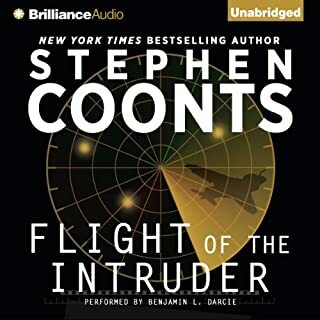 This series, beginning with Flight of the Intruder had been one of my all time favorites. Unfortunately, as the author continued down the line he had to stretch the capabilities of the characters, and in this book he officially "jumped the shark". The plot line is totally unrealistic, and the actions performed by the hero are simply nonsensical. Love the series. Less suspense than normal. However author again explores another world political scene at a point of change so much more intelligent than sone spy/military adventures. A very American story with a very American appeal. 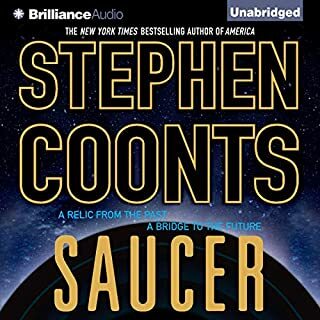 Had to delete it from my audio bookshelf.